Steel tubing frame with a red powdercoat finish resists wear and tear 16 in. poly-spoked rear wheels and 4 in. front swivel casters move smoothly over various terrains. Keep the gym or playground tidy with this All-Terrain Ball Locker. 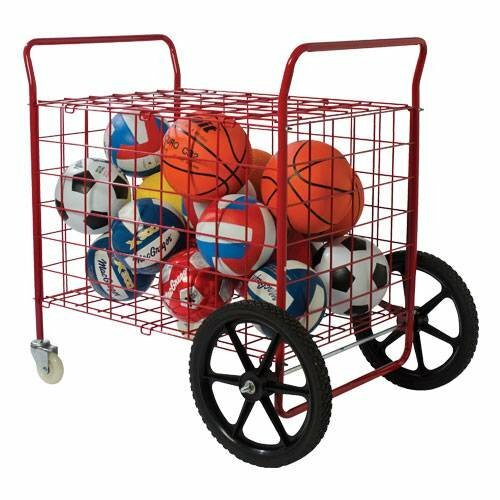 With a capacity of up to 15 official-size basketballs or 25 volleyballs, you can store plenty of equipment for a wide range of activities. Bring the ball locker anywhere you need, as the heavy-duty poly-spoked rear wheels and front swivel casters travel easily over hardwood floors or outdoor surfaces. Enjoy peace of mind thanks to the welded wire mesh body and lockable cover, which keep your equipment safe and sound. Size: 46" L x 30" W x 38" H - 50 lbs.